As we promised a couple of weeks ago, we are rolling out a very useful feature that’s 100% in line with our performance-based thinking model: custom conditions. 2Performant strives to be a meritocracy, where the pay is directly correlated with the effort. Thus, we always advise advertisers to do the same and offer a special package to their most worthy partners. This way, everybody ends up with long-lasting, fruitful business relationships. Simply put, this new feature allows advertisers to reward their best performing affiliates with a custom commission and/or a custom cookie life. For example, if a program has a default sale commission of 5%, the advertiser can offer a 20% increase (or 1.2x multiplier, as we call it) to a certain affiliate. This gives the affiliate a total commission worth 6% of each sale they generate. Moreover, if the default program commission increases to 6% in the future, that same affiliate will have a 7.2% commission (as granted by his 1.2x multiplier). This model also applies to variable sale commission programs. 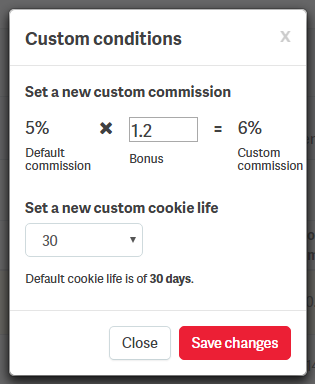 So, regardless of the final commission amount, if an affiliate has a custom multiplier, that commission value is altered by the multiplier, so that an affiliate gets a different commission than those who have the program default. 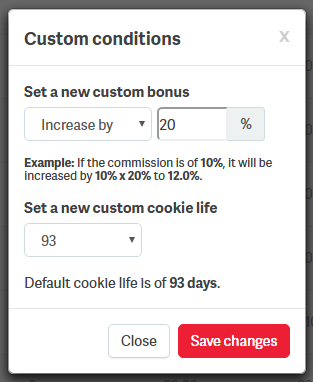 Custom cookie lives are even easier to manage: advertisers can pick custom cookie lives out of the default 30, 60 and 90 days values. It’s important to note that this only applies to sales at the moment. We are working on custom lead commissions as well, but for the moment an advertiser can only alter their sale custom conditions. 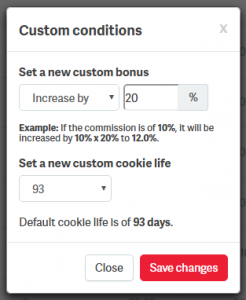 Note: Better conditions get applied immediately, but lowering them implies a period equal to the cookie life, but no longer then 30 days notice that will be automatically enforced by the system once you Save the change. What do you think about this new feature? We’d be happy to hear your feedback in the comments below.